While Rome is a large city, it hasn’t been hard for the World Scholars to find our favorite places to visit including not only monuments, but small gelaterias and pizzerias. After living here for more than two months, we’ve all found places that are almost like home to us. Our food plan at our partner school, John Cabot University, covers a good portion of our meals; however we’re always ready to experiment in a country where food is a huge part of the culture. Il Miraggio, or “the mirage,” is a classic for all World Scholars because it serves traditional, homemade Italian food for less than eight euro and is right around the corner from our dorms. “Il Miraggio has every Italian food you could want and a really cozy environment,” says Leah Manfra, a World Scholar who goes almost every week. The restaurant’s also a great place to practice Italian because most of the waiters speak very little English. We love Il Miraggio so much, that the waiters can recognize some of our faces and have addressed us by name and asked us to eat dinner there again the next day! Another popular place we love is Café Lungara, which is also right around the corner and serves not only cheap espresso and cappuccino, but also café Americano, which is exactly what we all need for a long study session. The café is fun, upbeat, and serves a variety of pizza, focaccia, and other Italian lunches. With the option to stay and eat in the modern café or take our food to go, the café is a great place to grab food before class. Finally, the various gelaterias on the corners of our streets in Trastevere have our love. 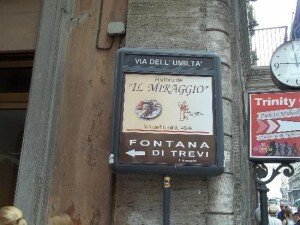 These quick stops serve inexpensive and homemade gelato, milkshakes, granita, and in the winter, cioccolata calda. Cioccolata calda is the Italian version of hot chocolate, which is thicker and has more chocolate than milk in it. It’s almost like drinking fudge because of the near absence of milk. All of us World Scholars love living in Rome, and we’re all going to miss the amazing food, drinks, and snacks we can grab just by walking down the street.